TocobestTM -The best VE for your life. Vitamin E is the collective name for 4 tocopherols (α-,β-,γ-,δ-) and 4 tocotrienols (α-,β-,γ-,δ-). It is a fat-soluble vitamin, essential for body to function normally, mainly found in vegetable oils (especially soya, peanut, palm, safflower, sunflower, and cottonseed), nuts, cereal germ and etc.. The most active form of vitamin E is alpha-tocopherol, which is the form of vitamin E found in the largest quantities in blood and tissues. Kangcare TocobestTM vitamin E is available as tocopherol or tocopheryl acetate, tocopheryl succinate, Tocopheryl Polyethylene Glycol Succinate, as oil, wax or several different types of powder, for feed, food, pharmaceutical and cosmetic use. 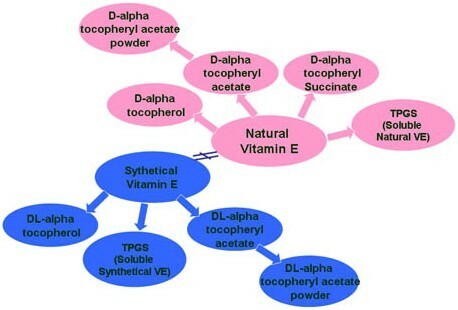 Through extensive research and development, Kangcare Bioindustry is now able to offer the highest quality of natural and synthetical vitamin E.
Vitamin E refers to a family of eight molecules having a chromanol ring (chroman ring with an alcoholic hydroxyl group) and a 12-carbon aliphatic side chain containing two methyl groups in the middle and two more methyl groups at the end. For the four tocopherols the side chain is saturated, whereas for the four tocotrienols the side chain contains three double-bonds, all of which adjoin a methyl group. The alpha form has three methyl groups, the beta & gamma forms have two methyl groups and the delta for has only one methyl group. If you want to get the detailed product information(Specification, datasheet, etc. ), please contact us. 1. What is the source of TocobestTM Natural Vitamin E? Non-GMO Soyabean. It is derived from the deodourized distillate of soy oil. 2. What is the main application of TocobestTM? 3. Do you have water soluble Vitamin E? 4. What is the shelf life of TocobestTM? The product may be stored for 24 months from the date of manufacture in the unopened original container and at room temperature. It should be protected from light, heat, oxygen and moisture. Keep the container tightly closed. Once opened, use contents quickly. 5. 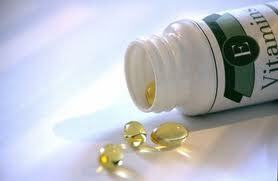 Are there any differences between natural and synthetic vitamin E? Yes. There are actually three asymmetric carbon atoms in tocopherol. Synthetic Vitamin E is a racemic mixture of all 8 = 23 stereoisomers. So it is called All-rac-alpha tocopherol, or dl-alpha-tocopherol. While the common natural form of alpha tocopherol has the IUPAC name 2R,4'R,8'R-alpha- tocopherol (RRR-alpha-tocopherol, or d-alpha-tocopherol). 6. Is esterified vitamin E more stable? Yes. That is why we produce esterified Vitamin E. Esterified vitamin e will be de-esterified to free tocopherol in our intestine before absorption. 7. Do you have any finished products?